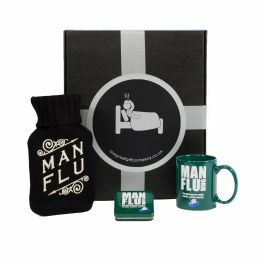 Man Flu Gift Box (UK ONLY)GG15The gift to give him when he's really, really, really poorly - with "man flu"! It's not a cold. Really. It's flu. Really bad flu. Man Flu is a crippling and debilitating illness which indiscriminately targets and strikes down male members of the human species. While Man Flu doesn't kill, it does leave the affected man in need of care, love, attention, understanding and endless sympathy Man Flu doesn't strike down females who sometimes don't fully understand the severity of the illness and that it is, indeed, much much worse than the common cold; the variant which women tend to get. The gift to give him when he's really, really, really poorly - with "man flu"! It's not a cold. Really. It's flu. Really bad flu. Man Flu is a crippling and debilitating illness which indiscriminately targets and strikes down male members of the human species. While Man Flu doesn't kill, it does leave the affected man in need of care, love, attention, understanding and endless sympathy Man Flu doesn't strike down females who sometimes don't fully understand the severity of the illness and that it is, indeed, much much worse than the common cold; the variant which women tend to get.